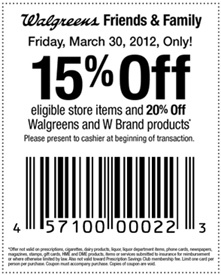 Wow, today only you can take 15% off eligible items and 20% off Walgreen's brand products with this great coupon! Take note of excluded items listed on coupon, and hand it to the cashier at the beginning of your transaction. Click here to print it out.